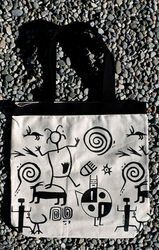 PETROGLYHS –Ancient Rock Art appears throughout North America. They all seem to incorporate forms of humans, animals, plants, many abstract shapes and forms. There are many interpretations as to who created them, what they mean, when they were made, etc. The true story behind all of them still remains a mystery to this day. Observe and appreciate them.